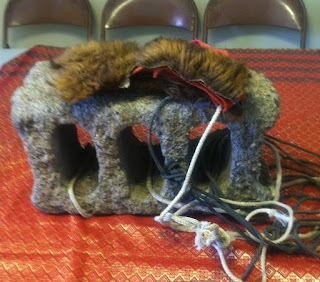 It’s not until I’m on 95, driving out to visit my dad, that I realize what to do with the fur hat tied by ropes to a cinder block in the trunk of my car, a “brain anchor” used as a prop by a friend in a surrealism creative writing class. My father not only introduced me to the world of surrealism when I was a child, he currently inhabits one of his own. I’d called him the day before to ask his permission to write about him because, I tell him, there’s nothing else right now I can imagine writing about. Still, I feel like a vulture scavenging for blood. “Oh, of course you can,” he says, surprising me as he always does with his generosity. “I would be honored.” And then he suggests I write an even longer article for a national magazine, because people love to read about other people’s dying parents. “I’ve had another home invasion,” he tells me. “It’s time to stop driving. I’m deteriorating, Valley,” he says. “What kind of home invasion?” I ask, but I already know. After suffering a series of micro strokes two years ago he began to undergo a string of MRI’s and psychiatric evaluations which have turned up the words inconclusive, abnormal and dementia. When I sob to a friend on the phone, the gravity of the situation finally hitting home, she says, “It’s like watching a redwood fall in the forest.” And she’s right. My dad has always been fit and tall and handsome but I think it’s the largesse of his imagination she’s referring to. Growing up, he always kept an open house, an open mind and a tendency to regard the lines between reality, dreams, poetry, fiction and fact more like suggestions than absolutes. As a child, he opened up for me the world of story. Now, at 63, his mind is writing a whole new chapter. When I pull into my dad’s driveway he’s bright eyed, holding a riotous fistful of purple irises from his garden. I drive him around to do the things he can no longer do by himself and when we’re done, because I don’t know what else, other than my time, I can give him, I pull the brain anchor out of my trunk. 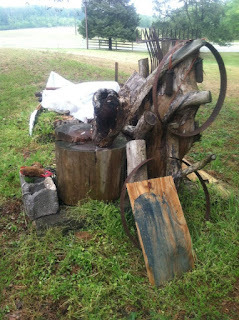 “It’s perfect!” he says and shows me a sculpture in the front yard made of bits of metal and discarded scraps of wood. “I call it stacking,” he says. And he explains to me his new art form, one that takes on different shapes and unexpected dimensions, becoming more bizarre and more beautiful each day. The executive director of Richmond Young Writers, Valley Haggard teaches creative nonfiction classes for adults at the Black Swan Bookstore, Chop Suey Books and the Visual Arts Center of Richmond. You can read more of her wonderful writing on her blog, www.valleyhaggard.com. This essay first appeared on her blog on May 31, 2012.